So you’ve decided on the food and the cake, but what about the drinks? From pre-ceremony cocktails to champagne toasts to the reception, drinks are a must! You’ll undoubtedly want drinks for your bachelor and bachelorette parties too. Not to mention your bridal shower. You could buy your own cases of wine or kegs of beer, but that’s just added stress! First, you have to choose what to serve. Then there’s licensing to deal with, not to mention buying cups and barware. Why not let a professional handle the cocktail catering for you? After all, Portland is home to some of the finest bartenders around. Portland cocktail caterers are the best, without a doubt! With our wide selection of beverage services, you can choose a cocktail menu specifically designed for you. Of course, you could always just serve wine, beer, and champagne at your wedding. Although, our expert mixologists can do much more. So why not get creative? If you want a cocktail menu that’s uniquely you, then you’re in the right city! Portland has both traditional beverage services and mobile bars too. Portable bars provide on-site bar service at your wedding venue. They bring the drinks, service, and barware to you, so all you have to do is relax and have fun. If you’re looking for craft beer, then look no further! With nearly 70 microbreweries in the Portland metro area, our surprisingly unique beer choices are sure to impress your guests. Portland is not only home to nearly 20 distilleries but is also surrounded by countless vineyards and wineries. Portland cocktail caterers proudly serve beer, wine, and spirits made with local organic ingredients. We have gluten-free options too. If you want award-winning Oregon-made beer, wine, or liquor for your wedding, we’ve got the best in the northwest! 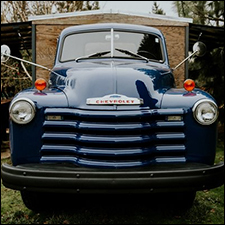 Full event beverage services from our 1953 Chevy booze truck, Betsy. Onboard refrigeration, six keg taps, wet bar, brick backsplash, reclaimed wood tables – all delivered in our vintage bar truck. Olive’s amicable bartenders will mix, shake and pour the experience that you are looking for. Our licensed and experienced staff are customer service specialists that understand that the bar is the hub of the party. Whether you are providing your own beer and wine, or a full cocktail selection, Olive Bartending will manage your beverage service from top to bottom. Be a guest at your own party, book your wedding today with Olive Bartending Service! 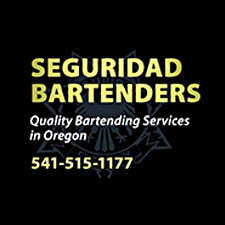 Seguridad Security is a thriving new company that provides quality security and bartending services for weddings and events around Oregon. 24959 S. Central Point Rd.